The Amalfi Coast, a 40 kilometers (25 miles) stretch of coastline between the Gulf of Naples and the Gulf of Salerno in Italy’s south, is definitely one of the most picturesque seaside landscapes I have visited so far. Not without reason, it has been declared a UNESCO World Heritage site as it is considered “an area of great physical beauty and natural diversity”. 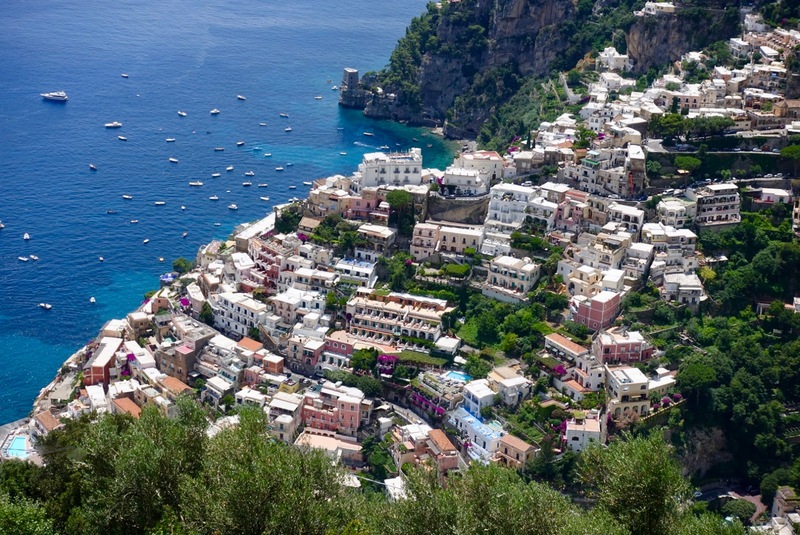 My husband and I based ourselves in Positano, the jewel of this region, for our six-day vacation to explore the area. What a sight, those colorful houses stacked on top of each other so tightly so that the cliff cannot be seen anymore! For information about a lodging option where to stay in style in the most centrally located town on the coast, have a look here. Our choice of accommodation was the gorgeous Villa Magia (red star on photo), set near the top of Positano. Another blogpost about where to eat as a fine food lover in this magnificent small town can be found here. When visiting the Amalfi Coast, it is well recommended not to spend your whole time on one spot but to take day trips in the area. Only this gives you the opportunity to fully enjoy the beauty of the region. parking is way too scarce and expensive and traffic was a nightmare at most times in shoulder season when we were here – I do not dare to imagine how it would be in peak season! The best time to go here are probably the months of May, June and October. During these periods, it is busy but not too much so and not too hot. I would recommend following means of transportation for getting around here. 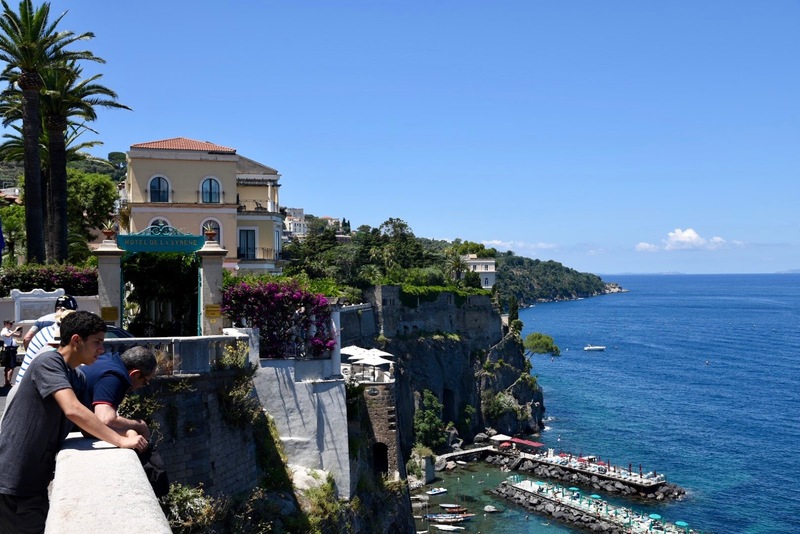 Take the ferry – there are regular ones between Sorrento, Positano and Amalfi –, preferably a high speed one, and the bus for routes that are not serviced by boat. In some cases, connections might be bad, or bus rides could be long. Then I would refrain from doing so as this costs you too much time. Given this situation, I would suggest that you arrange for a private driver. Such services are plentiful on the Amalfi Coast and all we checked had more or less the same rates. We did the booking through our hotel. Of course, such an arrangement is rather costly, but you have to take in account that you have no expenses for a rental car – which is very expensive by the way. I will give indications how much you have to spend when going into the trips in question. 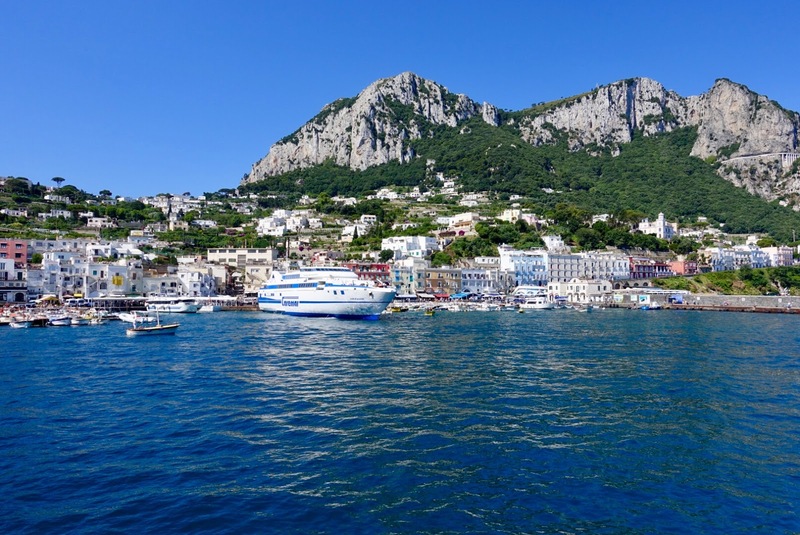 Ferry rides can be booked (online) one or more days in advance, the one to Capri needs to be done well in advance as it is a very popular destination. Bus tickets can be bought in newsstands, bars or cafés, NOT on the bus! 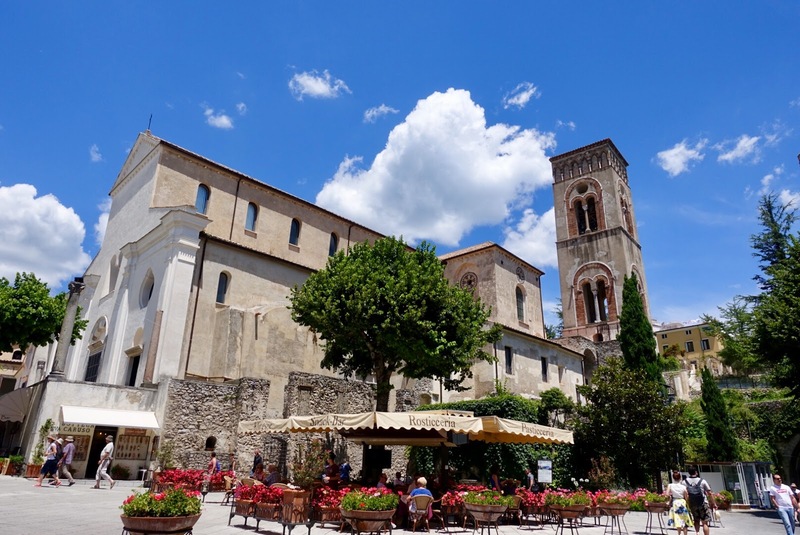 Ravello, perched high in the mountains above Amalfi, can be reached by Sita Bus from Amalfi (travel time 25 min, departure every 15 min from Piazza Flavio Gioia). We had a ferry ride Positano to here, which takes 20 minutes. 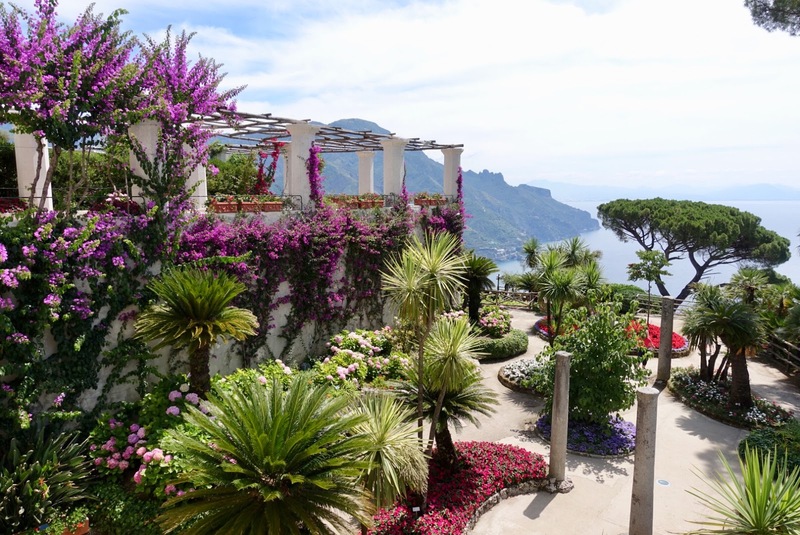 and last but not least follow the signs to Villa Cimbrone to wander among the beautiful gardens and to pause for the heart stopping views of the sea from the Terrace of Infinity. 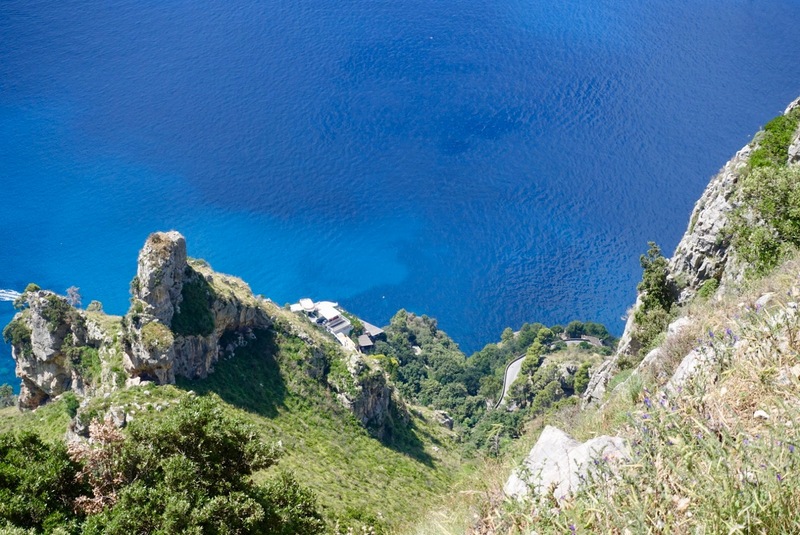 After this tour, take a bus back to Amalfi or – much better – take the (steepish and stepped) footpath down to Amalfi (well signposted, from church of Santa Maria a Gradillo), which lasts about one hour passing lemon trees and having stunning views of the sea and Amalfi and surroundings. In addition, you have the chance to roll up the largest town on the Amalfi Coast from the rear, a good thing as there are no tourists around when you get here, and the first sight is located nearby, the Paper Museum (Museo dell Carta), which does interesting tours about how paper was and is still made by hand. 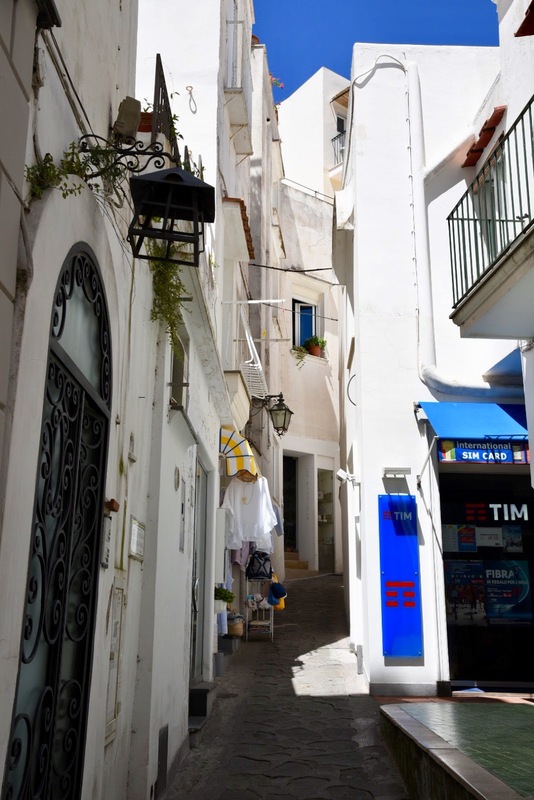 After having learned something about Amalfi’s town as a center of paper mills, walk into the direction of the sea where the historic town is located. 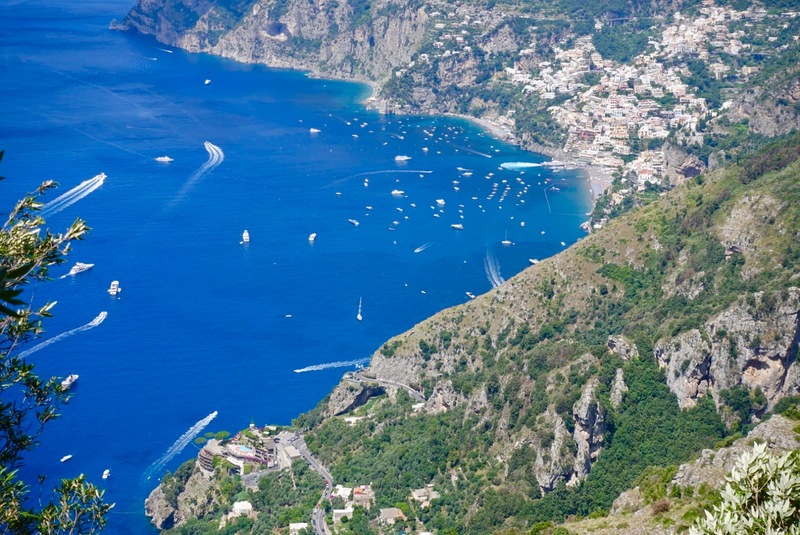 Amalfi is one of the few places on this coastline where space opens up. It is clustered with white houses and crisscrossed by a maze of alleyways. 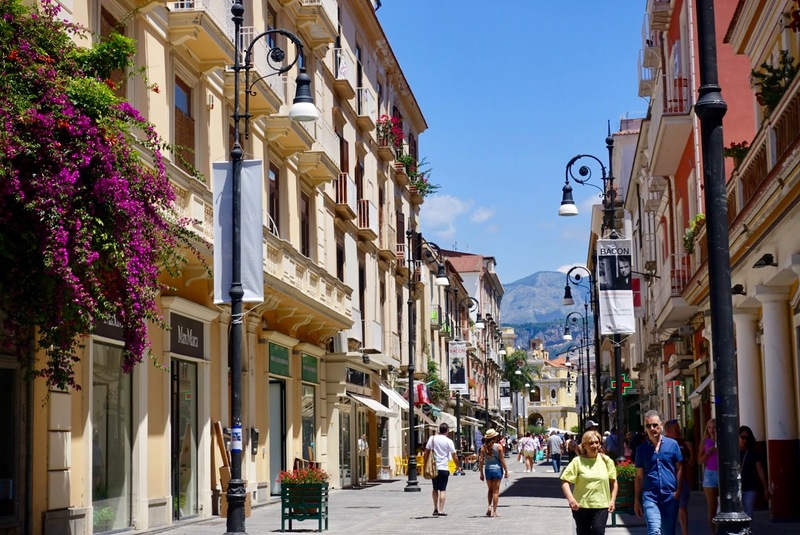 Go to the main square, the Piazza del Duomo, and climb the sixty steps to the impressive cathedral towering over the piazza with cafés and shops. 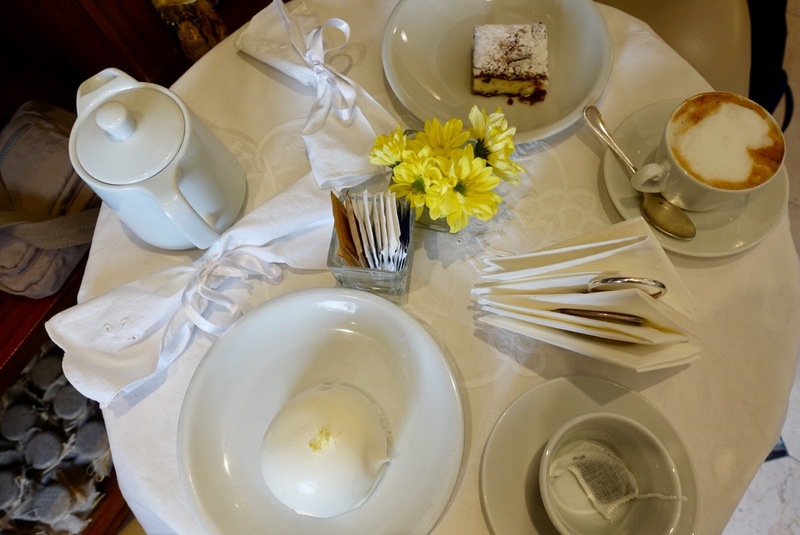 After having visited it, stop for a bite at the Pasticceria Pansa, Amalfi’s sweet institution since 1830. They have fantastic pastries here, maybe give the lemon delight (Delizia al Limone) a try as I did! 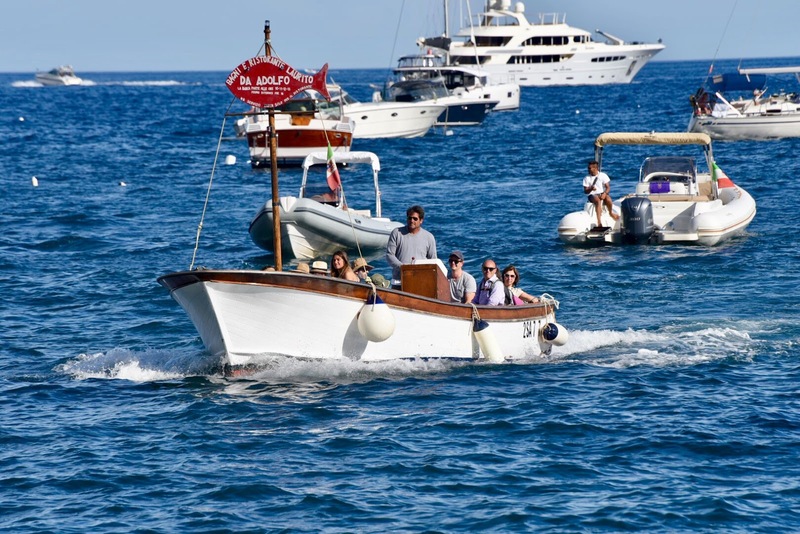 In a few minutes, you are on the water’s edge with a promenade along the Mediterranean and a marina full of colorful boats where you can board your ferry back to Positano. The ruins of Pompeii are not on the Amalfi Coast but not that far away from it. 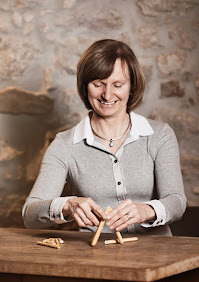 Therefore, a trip to Europe’s most fascinating archaeological site is well worth doing. The ancient Roman city of Pompeii was buried after a volcanic eruption of Vesuvius in AD 79. 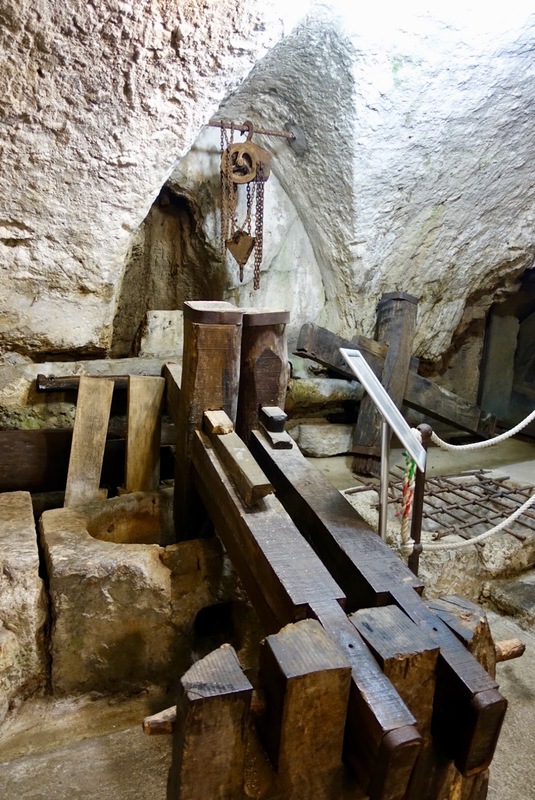 After 1,600 years of leaving the area untouched, in 1748 excavation works were initiated. The result of them is a remarkably well-preserved city, where visitors can walk down the streets and explore a variety of monuments. What surprised me most, is how big the place is. You need an hour or so just to cross the town. This is also owed to the fact that walking around is no easy thing as the ground is very uneven. Therefore, adequate footwear is imperative! On the question of how to get here from Positano, following can be said. It is possible to reach the site by bus to Sorrento and then by train to Pompeii, but it is a rather arduous journey. The most comfortable (and expensive) way to do it is by private transfer. A tour costs 200 € for four hours plus 40 € for every extra hour. 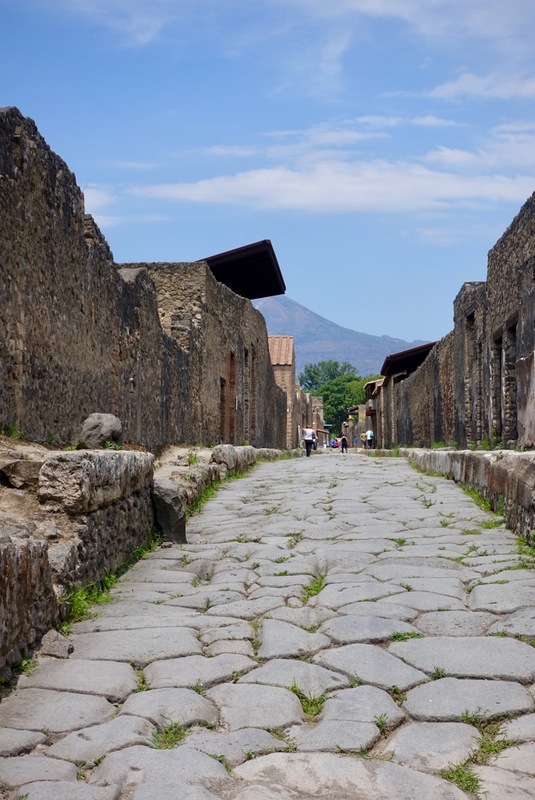 While you are visiting Pompeii, your driver will wait for you and will meet you whenever you are ready to return. The driving time is about one hour and a quarter, the minimum visiting time is three hours in my opinion, so a trip will cost you 260 €. In order to get a quick entry to the archaeological site, it is recommended to book online. However, you cannot print the ticket, but you have to queue in a separate, much shorter than the regular one, to get it on site. As to how to visit the place, it can be done on your own or you can arrange for a guide. As we found latter as too expensive and as we do not like being subjected to permanent babbling, we did it on our own. After buying a ticket, go to the adjoining information center and get a free guide and a plan. Best thing is it to prepare yourself a bit in advance about the history of the place and the main sights. Recommended attractions are: the Amphitheater, the Plaster Casts (positions of people at the time of their death, the Forum (main square), the Temple of Apollo (the oldest building), the Forum Baths (best preserved ones), the Large Theater, the Odeon (the Small Theater), Gladiator Barracks, the Brothel, the Large Palaestra (area for sporting activities), the Stabian Baths (the oldest ones), the House of the Faun (largest and most expensive home). 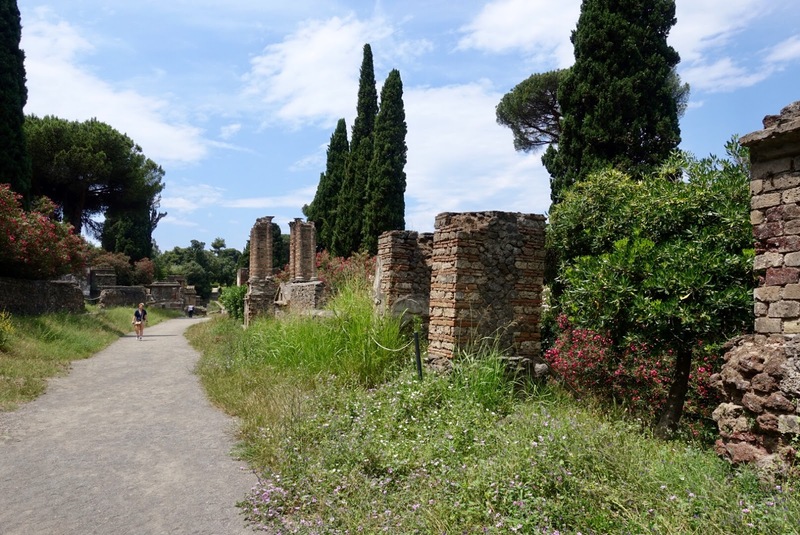 Be well advised of the fact that Pompeii is almost always very busy, a good idea might be to start with your explorations not right after the entrance but only after walking for a while. Come early as it might get hot in the afternoon. Be prepared that you will only get a glimpse when staying here for three hours. Nevertheless, it will leave you with a great admiration of the achievements of the Roman Empire. The “Sentiero Degli Dei” – as it is called in Italian – is immensely popular and justifiably so. It bends its way along terraces hundreds of meters (about 1,000 feet) above the sea, linking the town of Bomerano with Positano. Magnificent views can be enjoyed every single step on the way and you feel as though you are on top of the world. 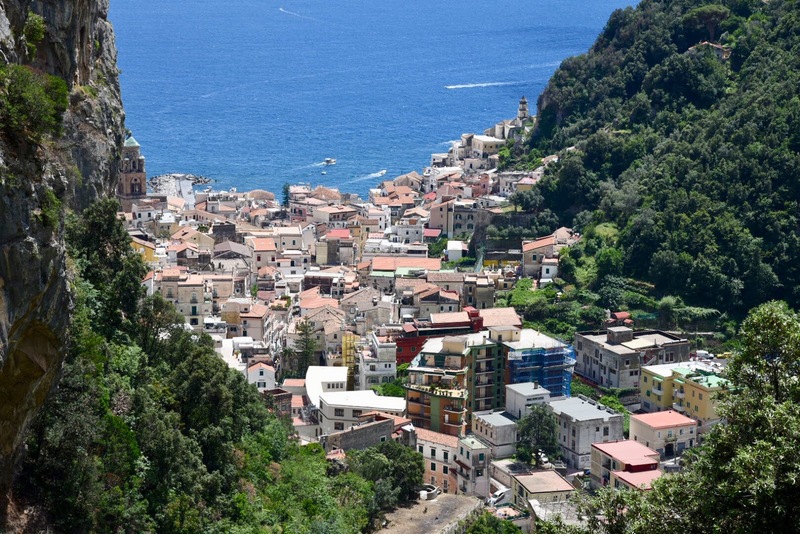 If you are wondering how to get to Bomerano, you can take the ferry to Amalfi and change there to the Sita bus. As this appeared cumbersome and time-consuming to us, we opted for a private transfer instead, costing 100 € and lasting about one hour. The starting point of the hike in Bomerano, a village that occupies a surprisingly flat expanse of upland on the southern margin of the Monti Lattari, is near the main square, Piazza Capasso. From there, the next village, Nocelle, can be reached in about one hour and 45 minutes if you walk at a fairly rapid pace. It goes up and down, but mostly downhill, over hill and dale. It is not a particularly difficult hike although not too easy either; adequate foot wear is in any case recommended. Over time, the terrain becomes wilder and the route more spectacular, and marginally exposed. 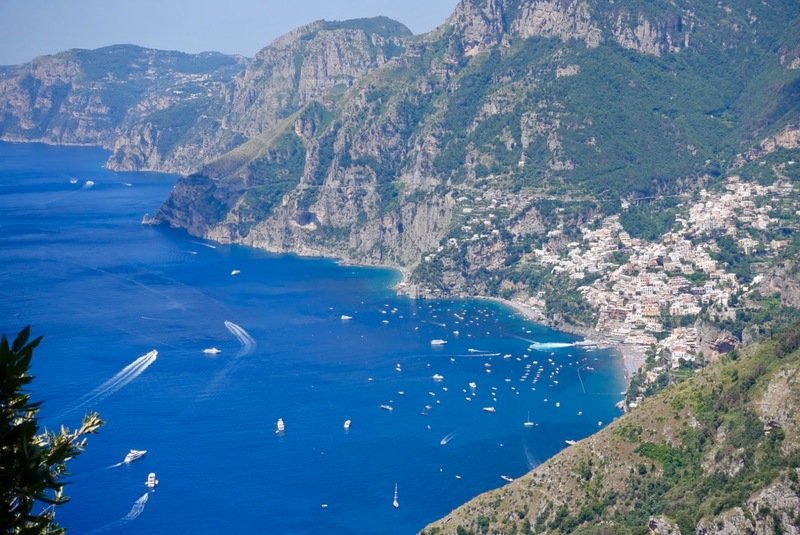 It does not take long until exciting views to Positano, nestling in its bay, can be enjoyed. Also glimpses of the crazy coast road below can be caught. Soon, the first houses of the pretty village of Nocelle appear. 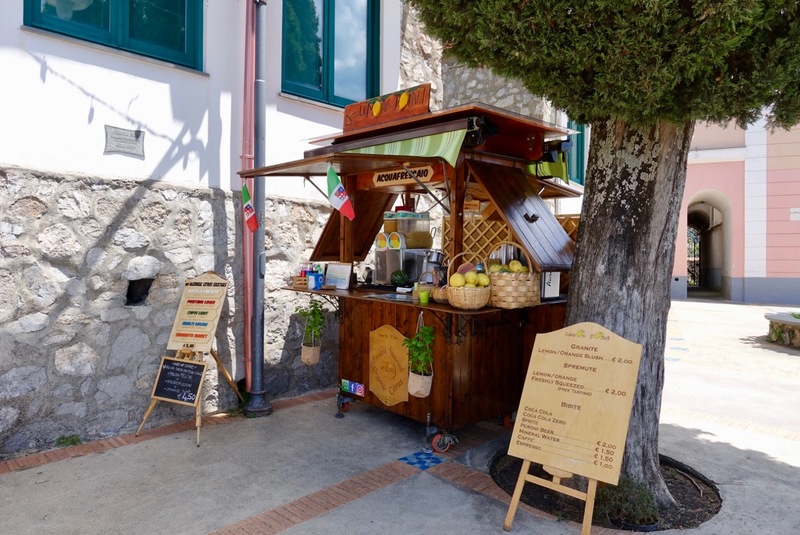 When reaching Nocelle, ignore the signs in descent for “Positano” unless you want to visit the shady Piazza S. Croce to have a great lemon juice and/or granita at Lemon Point as we did. Afterwards, go uphill following signs for “parcheggio” and keep on a pretty path overlooking awesome cliffs. Then join the surfaced road for strolling down to Montepertuso (45 minutes), another small village. This section is easier to walk as it is not a rocky path as before. In Montepertuso, head past the Ristorante Il Ritrovo and continue on the level pathway. 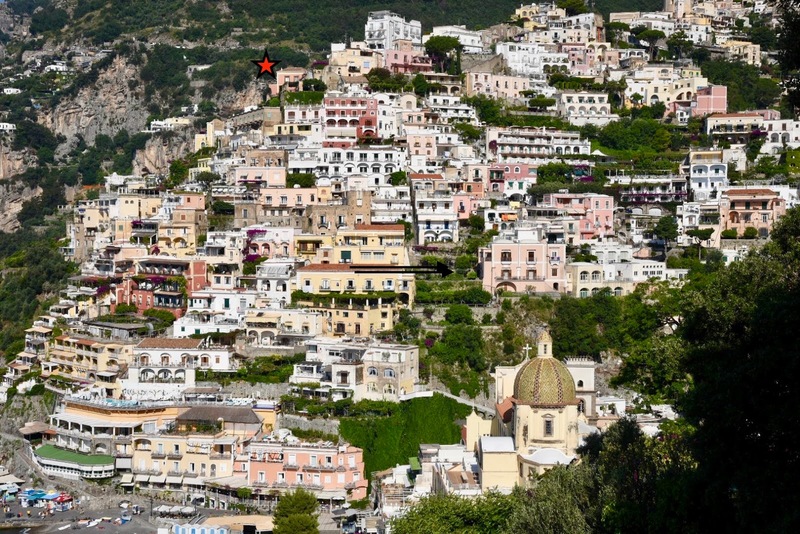 Next to a tobacconist (“T), turn left and go downhill via “Via Montepertuso” until you come to Positano (45 minutes). You can do this hike in about three hours and a quarter (walking time) if you are fairly fit. In any case, it is far from being a walk in the park. But for sure it is an utterly worthwhile thing to do with unparalleled vistas of this striking coastline. 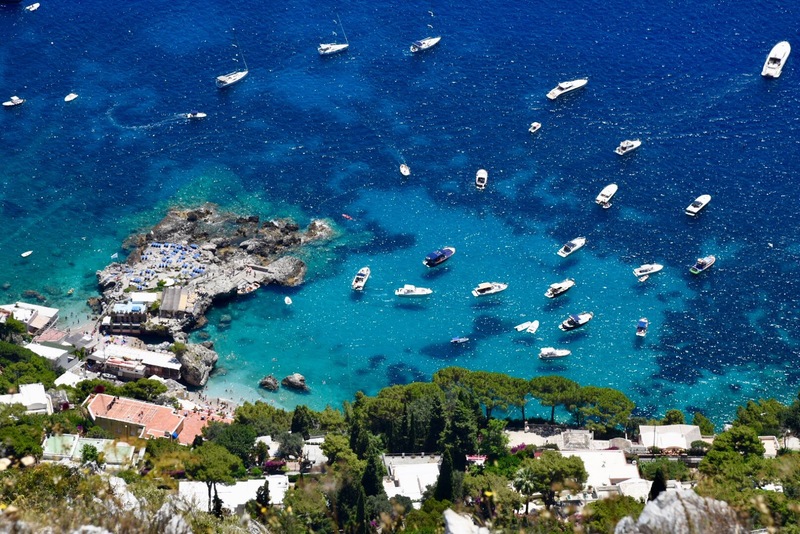 The good thing about Capri is, it is an exceptionally beautiful island! Its downside is that it bursts at the seams as it is extremely popular, so popular that the authorities think about limiting day tourists! 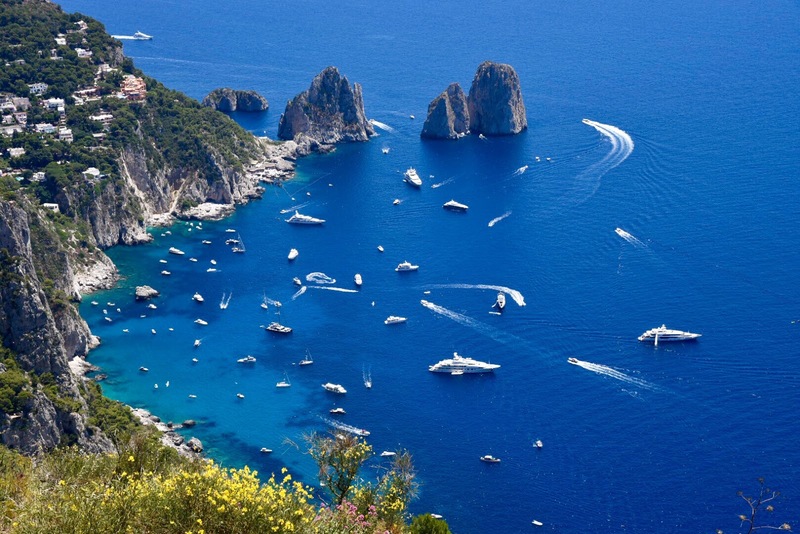 This was no reason for us not to visit it so we booked a ferry ride to Capri a few weeks prior to our vacation. Even then, the second to last ferry we wanted to take back to Positano was already booked out so we opted for the last one leaving the island. This turned out to be a fortunate coincidence but one after another. After a 30-minute ferry ride we arrived on the island around 10 am and encountered a hive of activity at the port of Marina Grande. 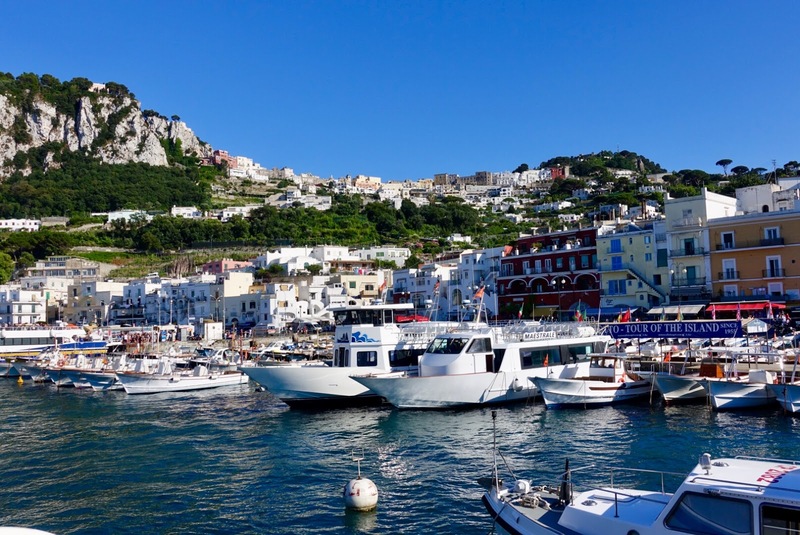 As you might be aware of, there are two towns on Capri, on the one hand Capri town, which is in the center of the island and where most hotels are located, and on the other hand Anacapri, situated on a plateau above Capri Town and supposedly the quieter place. 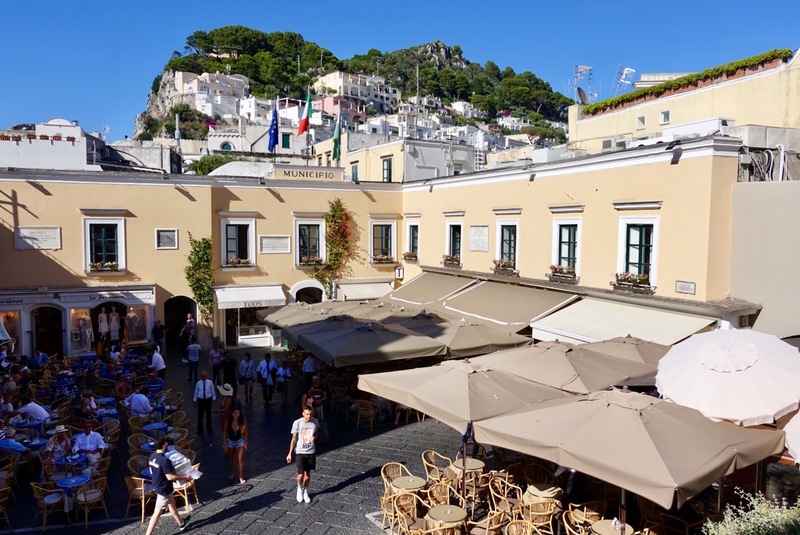 We had planned first to go to Anacapri and afterwards to Capri town. This meant for us to look for a transfer to Anacapri, either by bus or taxi. As there were no taxis around we queued for the bus. After 20 minutes of doing so and no buses in sight for the last 15 minutes, we lost patience and decided to walk up to Capri town (Piazzetta) by foot and to look for a transport there. This took us less than 30 minutes and was no big deal. Once arrived, we were faced with another queue at the bus stop so we took a taxi and paid 20 € for the 10-minute drive to Anacapri. After this poor start, the exploration of Capri could begin! Our first destination was the Mount Solaro, the highest point on the island with splendid views of the sea, the rocky cliffs and Capri town. After taking the chairlift up the mountain we decided to walk down to Anacapri with a side trip to the hermitage of Cetrella with panoramic views of the area. 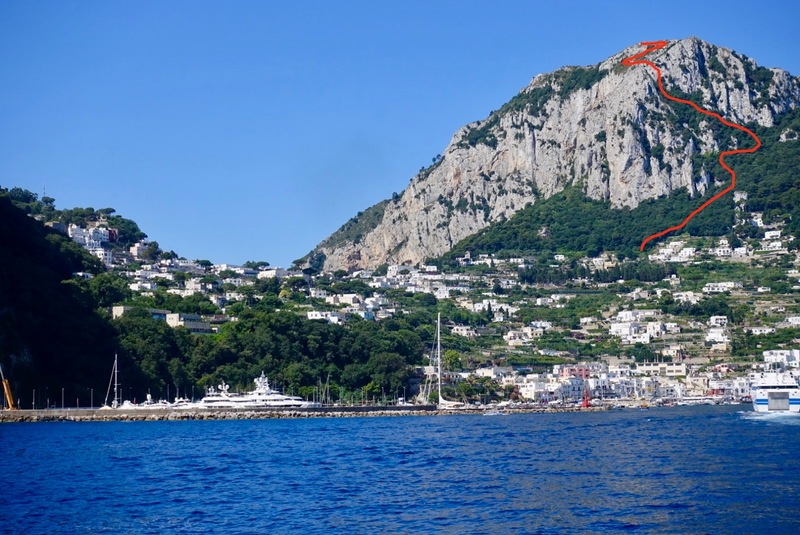 When getting there – spotting a signposted hiking path to Capri town – my husband and I decided spontaneously to take it. We did not want to queue for the bus or to be forced to take a taxi again. Actually, we had also planned to visit Villa San Michele down in Anacapri, a charming villa full of history, but we will save it for our next time! and moved through varied ecosystems, but I am not sure whether I would do it again! 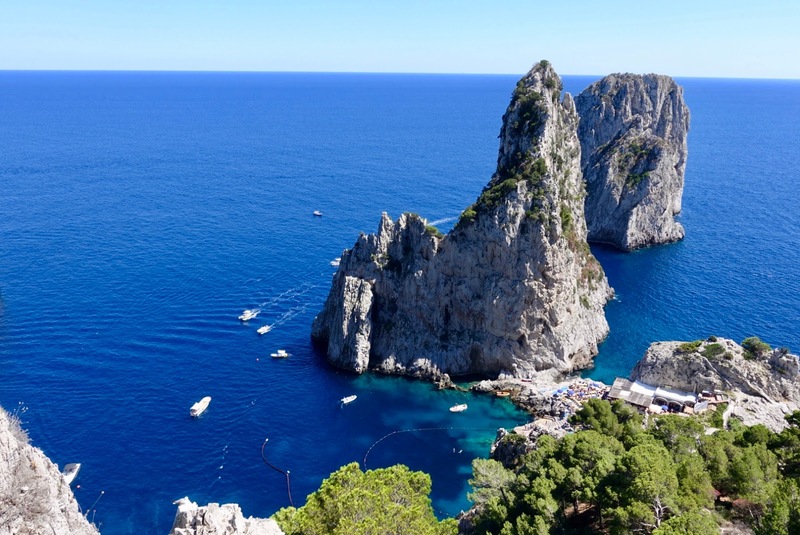 Later on, we learned that this trail is an old mule track, the ancient connection between Anacapri and Capri, called the Sentiero Del Passetiello. I have marked the trail in a picture so you can imagine a bit better. After this was done, it was time to get to know Capri town. If you are a gelato lover, you absolutely have to pay Buonocore Gelateria a visit. 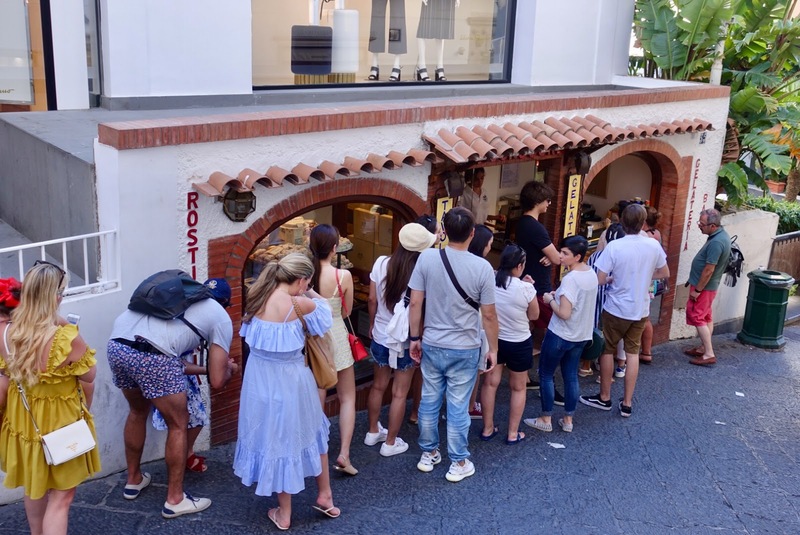 They have not only fantastic ice cream but also the best waffle cones, a must go in Capri! Strengthened by this snack, another walk (lasts about one and a half hour) was scheduled, this time an easy one, first heading uphill towards Arco Naturale (signposted) – an impressive rock arch. After this, there is a descent (many steps) almost down to the sea and finally the path continues along the cliffs with great vistas every now and then, the highlight is probably the one of the Faraglioni rocks. 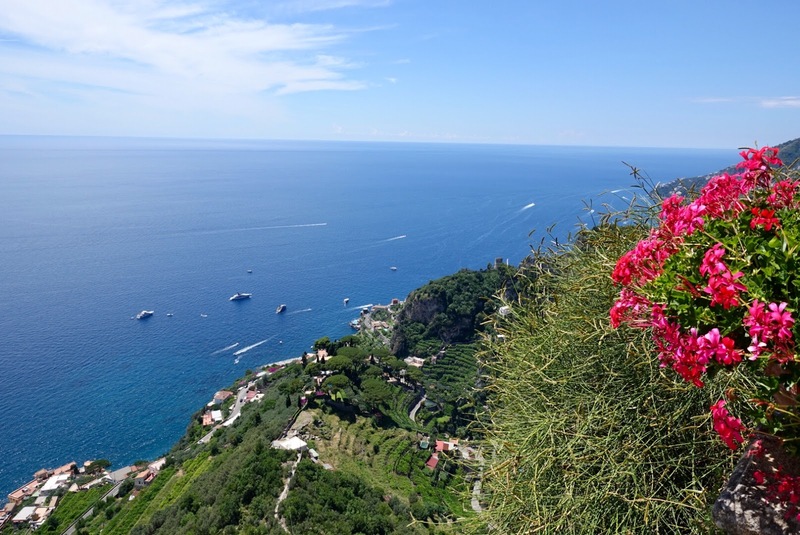 On the way back to Capri town (only a few steps up), a recommended side trip is the one to Giardini di Augusto, a peaceful garden where you have stunning views of the Faraglioni rocks again (best photo op is towards the evening). 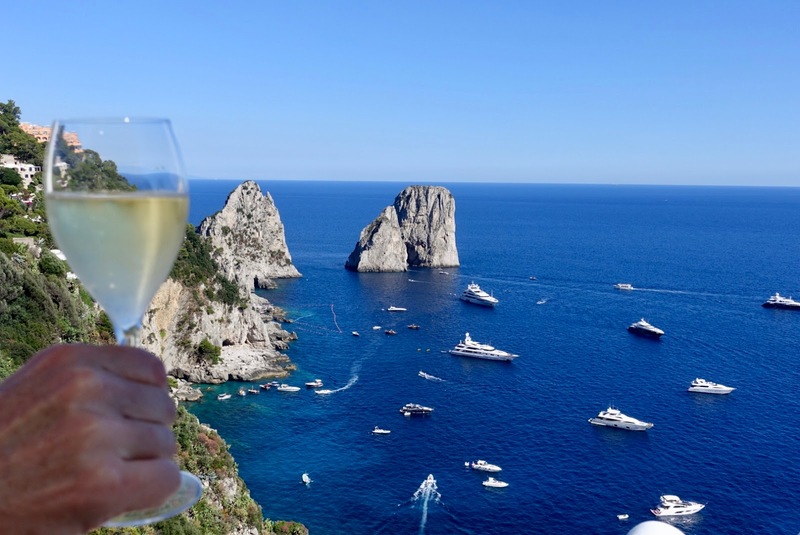 Before heading back to the Piazzetta (15 minutes) in order to walk down to the port (another 15 minutes), a good spot to have a drink is Capri Rooftop, a cool and stylish lounge/bar, again with a magnificent scenery before your eyes. in the evening when most of the daytrippers have already left the island. You can stroll through the narrow alleys and marvel at the beautifully preserved old town without hordes of tourists around. 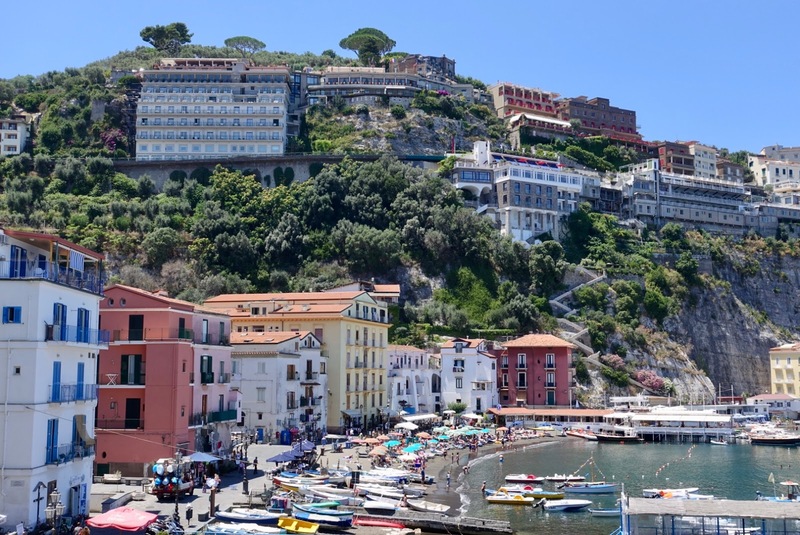 We wanted to complete the picture of the area by visiting Sorrento, which is the gateway to the Amalfi Coast and the right place to feel the pulse of a small yet lively Italian town. Once again we took the ferry to get here (40 minutes). Arriving at the port of Marina Piccola at the foot of the cliffs you can either catch the lift or walk up to the town center. 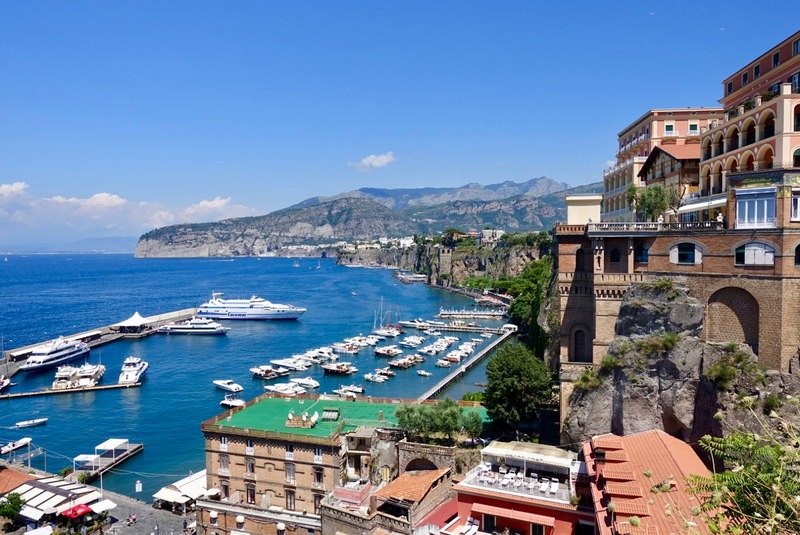 Sorrento, perched favorably on a plateau above the sea with great views over the Bay of Naples, has been a popular tourist destination for almost two centuries. While it attracted the rich and famous at the time – there are still many grand hotels to look at – it is now a leading package vacation destination. Nevertheless, it was able to maintain its Italian character and charm. towards the quaint fishing village of Marina Grande. Here at this harbor with small fish restaurants, many boats coming and going and a small beach time seems to have been stood still. tucked away in the old town offering a variety of interesting flavors to choose from. The ice cream is creamy and tasty, definitely worth a visit! The Amalfi Coast is easily the most stunning coastline I have ever experienced. When you are based in Positano as we were (see my blogposts about our stay at a fine luxury boutique hotel and about dining opportunities here,) you are not only ideally located for plenty of memorable daytrips in the near surroundings, but you also have the advantage of staying in the most picturesque town of the area. 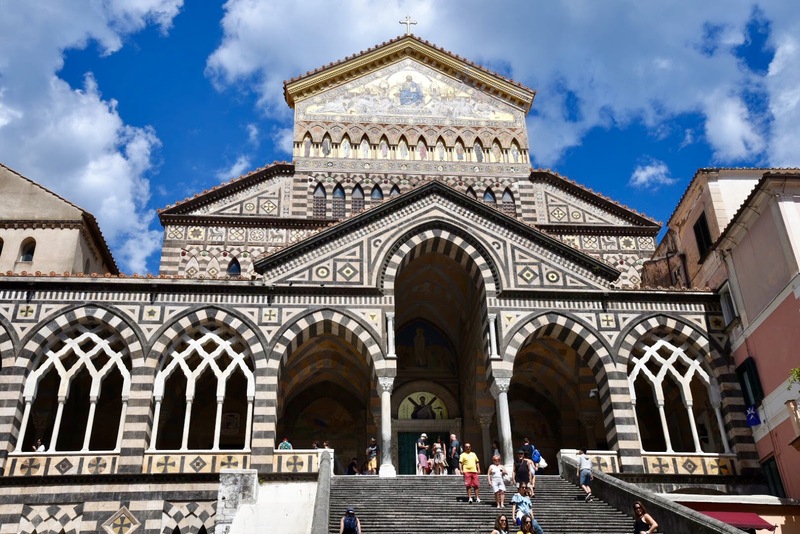 One of the great attractions of a visit to the Amalfi Coast is the opportunity to explore the rich cultural and natural landscape of the surrounding Campania region. Everything is within easy reach and there is no need for a rental car as many places can be reached by ferry (Amalfi, Capri and Sorrento). 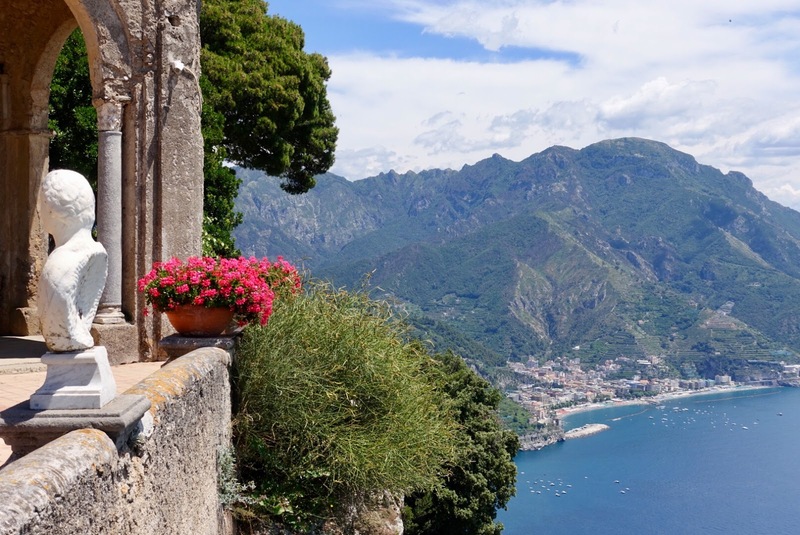 To others you can get by bus (Ravello and the trailhead of the Path of the Gods from Amalfi). If you want to travel more comfortably, you can also arrange for a private transfer, which makes sense when going to Pompeii or hiking the Path of the Gods. 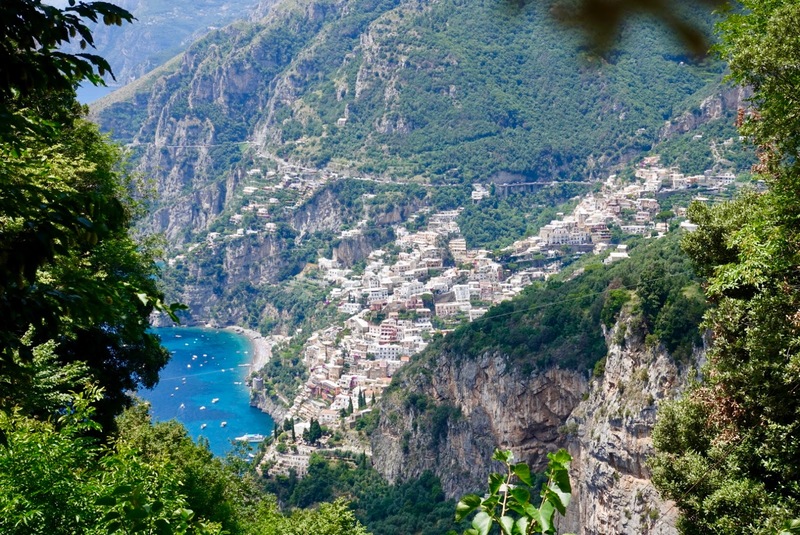 In any case, the Amalfi Coast has to be on the bucket list of every travel enthusiast. It is hard to imagine an equally beautiful coastline!